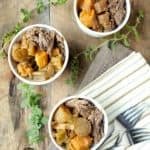 With the craziness of the holidays (ok, pretty much any time of the year), cooking with our Instant Pot sounds like a good idea to keep dinners mostly hands-off and easy. 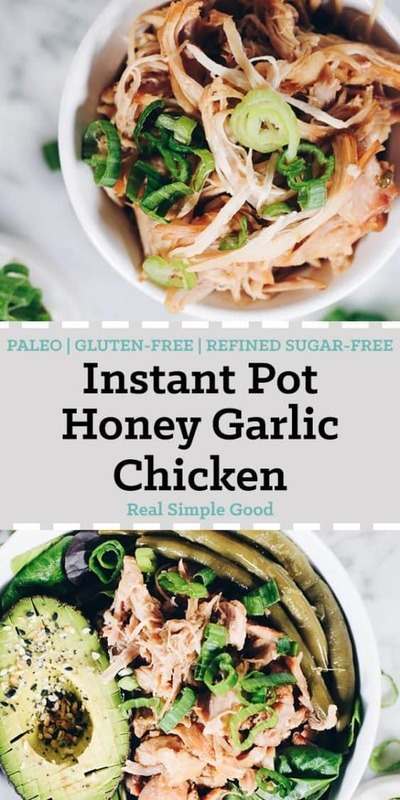 This Instant Pot honey garlic chicken is a great make-ahead meal prep recipe! It’s no secret, we are chronic meal planners. Both Justin and I are very routine and habit based, and we love having our meals all planned out in advance, shopped for and prepped to the extent we have time. It just makes the week go so much smoother, and makes us feel like we are able to just enjoy one another in the evenings rather than hustling to figure out what’s for dinner and then run to grab ingredients, etc. By the time we get to Monday, it’s all taken care of and pretty much smooth sailing for the week, at least when it comes to food! 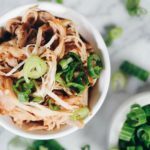 Recipes like this Instant Pot honey garlic chicken are perfect for meal prep because you can easily turn it into a lunch or dinner as needed during the busy week. We love the versatility of this honey garlic chicken. It’s super easy to pair with just about any veggie, greens and even plain white rice if you tolerate it. Here’s a look at a simple way to use it as the protein in a pretty typical bowl at our house. We used mixed leafy greens, some pickled green beans from Justin’s mom and avocado with that yummy Everything But The Bagel seasoning from Trader Joe’s! If you haven’t tried that seasoning yet, just do it! You will wonder how you ever lived without it! We ran out of sauerkraut, otherwise I would have added a big pile of that on there too, but we ran out…so you know real life stuff. 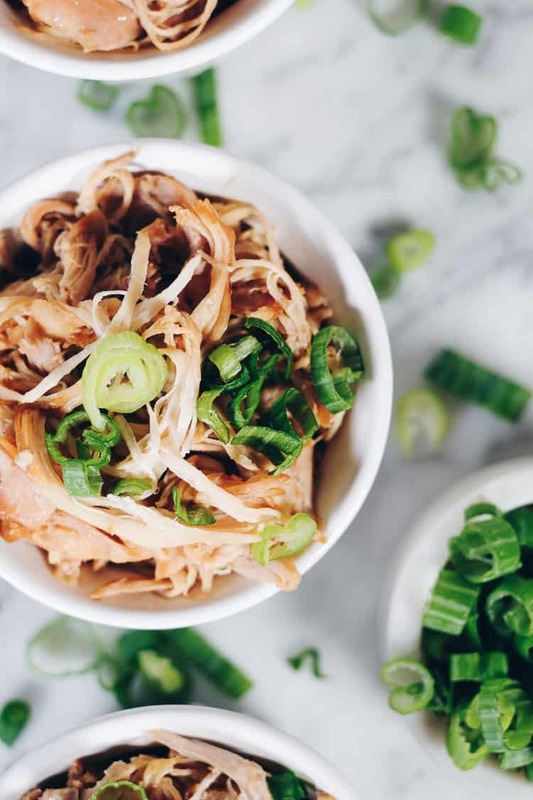 We love our Instant Pot since it cuts down on cooking times, but this honey garlic chicken can also be made in the crockpot just as easily. Use whichever you have or prefer. 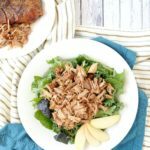 Either way, you will end up with delicious shredded chicken that you can use to pair with whatever veggies, greens or sides you prefer! I’m thinking now that it would be a great one to stuff sweet potatoes or squash with. I’m making a mental note to try that out real soon! 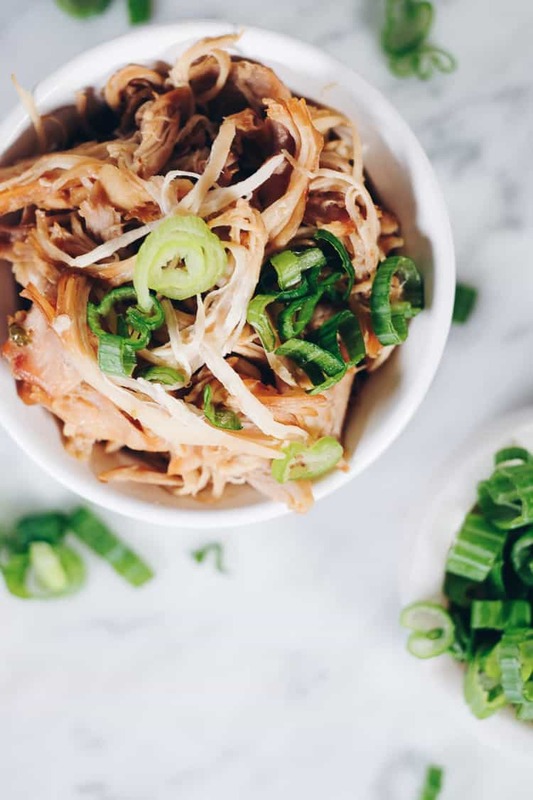 Go ahead and bust out either your Instant Pot or Crockpot and make this honey garlic chicken! Then, take a photo and show us what you paired it with. Tag us on Instagram @realsimplegood, so we can see! Also, let us know what you think by leaving a comment below. 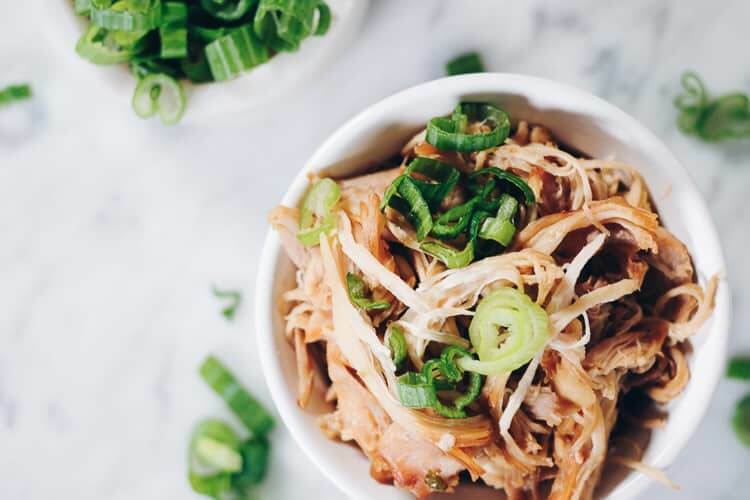 This Instant Pot honey garlic chicken is a great make-ahead meal prep recipe! It's quick, easy and also Paleo, Gluten-Free, Soy-Free and Refined Sugar-Free. 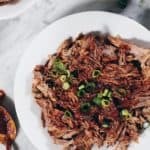 Place chicken in the bottom of the instant pot. 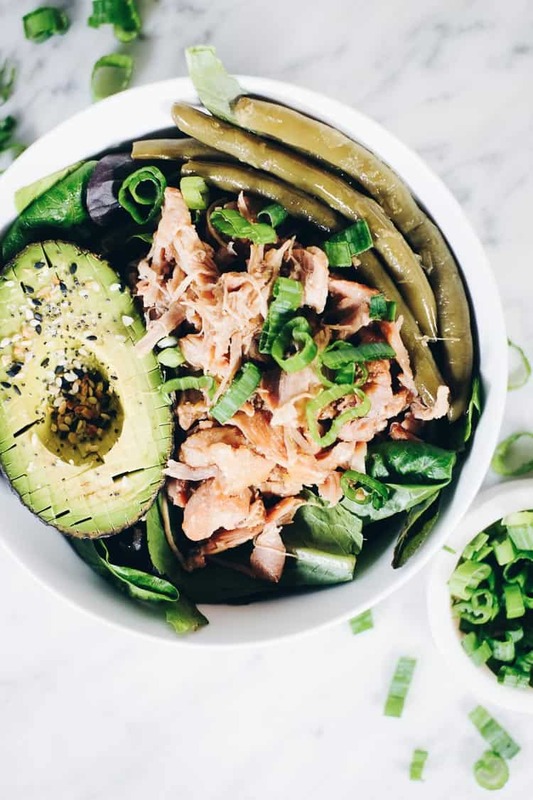 In a bowl whisk together the coconut aminos, honey, fish sauce, vinegar, sesame oil, ginger, garlic and the white parts of the green onions. Pour the sauce mixture on top of the chicken. Cook in the instant pot on the manual setting for 22 minutes. Alternatively, you can cook in the crockpot on high for 3 hours or on low for 6 hours. Manually release the instant pot. Once the pressure has released, remove the lid and shred the chicken with two forks. This is fantastic! Makes quite a bit more than I needed since it’s just two of us, but we noshed on it for lunch for days. I would happily serve this for company. This was delicious! I didn’t have fish sauce so I used oyster sauce instead but it was still fantastic to me! Next time I’ll try it your way, with fish sauce. Thank you for sharing! What do you pair it with? 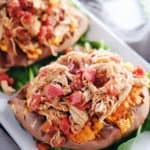 I’m new to Paleo and love new ideas! So glad you enjoyed it! Thanks for giving it a try and leaving a comment. I just made this dish and found the liquid didn’t cook in very well. There is plenty of liquid but the chicken is somewhat bland. The sauce has a great taste but I would have loved for it to cook into the chicken better. I’m wondering if perhaps it needed to cook longer— in the recipe above, the cook time is listed as 35 minutes up top but in step 3, the cook time is written as 22 minutes, which do you usually follow? We noted the cook time as 35 minutes because it takes a little over 10 minutes for the IP to come to full pressure. Setting it for 22 minutes should be fine. Sorry to hear that your chicken didn’t turn out as you would have liked. Did you shred the chicken in the IP? That’s what we do and we also spoon some of the juices from the IP onto the chicken when serving. That gives it some extra flavor. You could also marinate the chicken in the sauce if you’d like to “set in” the flavor better. Thanks for trying our recipe and leaving a comment! Fantastic! Make this, you will not be dissappointed. Added a little siracha when serving. Love it, adding to our favroites. This is so good! But I think 2 tbsp of fish sauce is a bit excessive- atleast it was for me!! Next time I will do only 1 tbsp. Otherwise its super good! Thank you for sharing!! 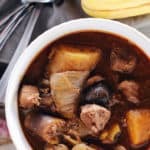 Just finished this in the instant pot. Super easy recipe and fantastic chicken! I added half julienned green pepper and half a brown onion cut the same way, and sprinkled some coarse sea salt and fresh ground black pepper so it would look like I knew what I was doing. I strained it after deboning and shredding the chicken, made one more pass for cartilage or bone pieces, and it’s soaking in the leftover sauce – ready to go for tomorrow. Sounds delicious! Thanks for coming back and letting us know :). What does ‘manual’ release mean? Are we supposed to do instant release or natural? Thanks in advance! Hi there! Manual release is the same as instant release, so once the IP timer goes off release the pressure. Also, please see step #4 in the instructions. You shred the chicken once it has cooked in the IP right before serving. Hope that helps! Also, I’m confused, are we supposed to shred the chicken? It doesn’t say to do so in the recipe. I put the chicken thighs in whole (the way the came at the store). However I find the the instant pot recipes call for such huge amounts. I’m a complete novice with this. I have half the amount of chicken (1.5lbs), so I’ll halve the amount of ingredients and do I halve the amount of cooking time? Or is this where I press the poultry button and it calculates it accordingly? Katy – you can cut the recipe ingredients in half and cook the chicken for 15 minutes at high pressure with a quick release (for 1.5 lbs of chicken). We love this recipe! So so easy and full of flavor. It’s even my 12 year old’s favorite meal currently 🙂 WIN! 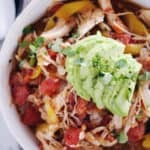 Thanks for a delicious, healthy, and simple recipe! Did I miss something? It says you’ll use both parts of the onions, but I only see where it uses the white part. They’re to add on top when you serve! Added a note in the recipe card. Thanks!